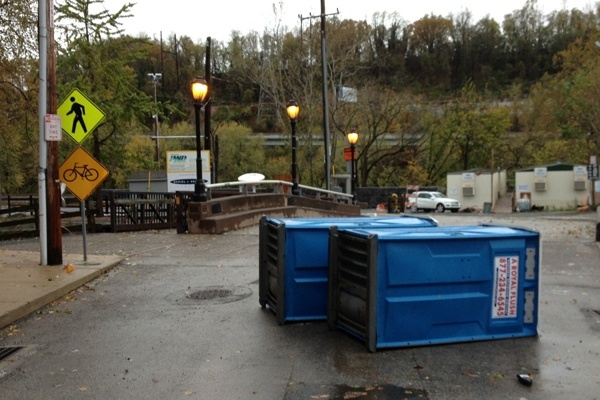 An official release from SEPTA states that regional rail service will be restored Wednesday morning following disruptions due to Hurricane Sandy. Trains on all regional rail lines will follow regular weekday schedules starting with the first trains on Wednesday. Customers may experience residual delays and are advised to allow extra time for the morning commute. 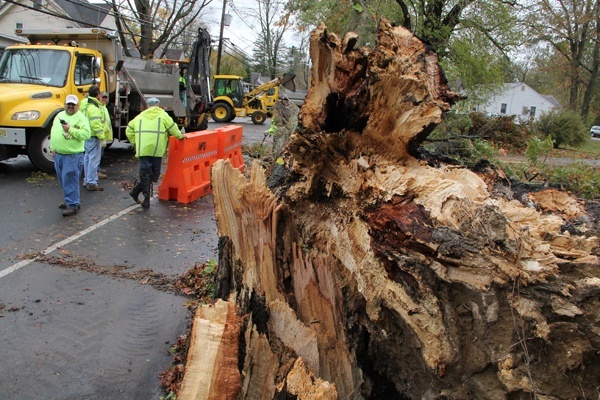 This resumption of service follows the restoration of operations at noon Tuesday on the Market-Frankford Line, Broad Street Line, Norristown High-Speed Line and city and suburban bus and trolley routes. All of these services will continue on regular weekday schedules for the start of service on Wednesday morning, with the exception of a few bus routes that cannot currently run due to road conditions. For specific bus detours and other service announcements, customers can visit www.septa.org. 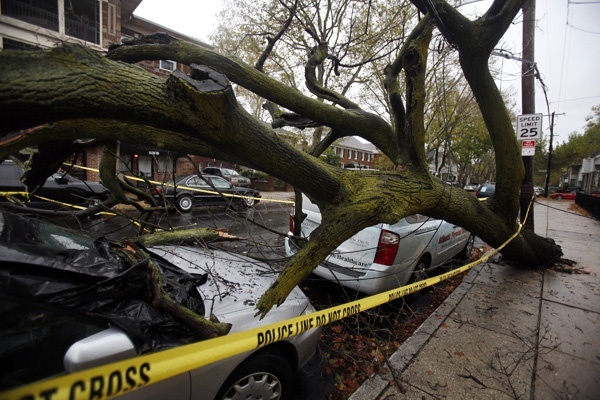 The death toll from superstorm Sandy continues to climb. 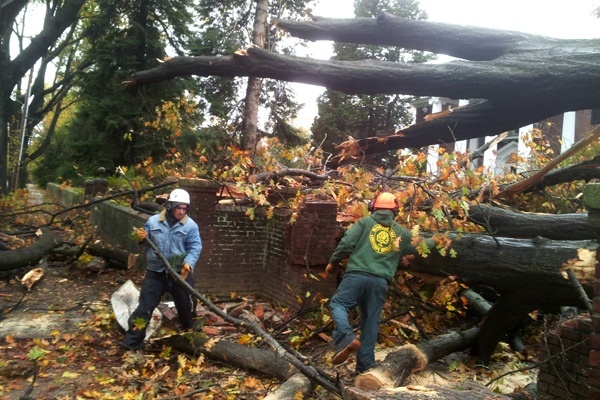 Authorities say at least 34 people have died, many crushed by fallen trees. 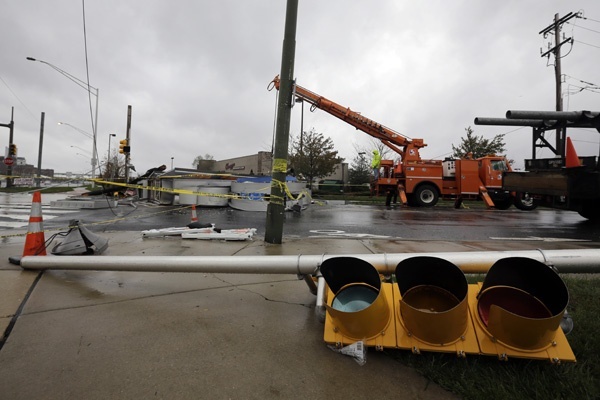 A fifth Pennsylvania death has been linked with the hybrid storm still lingering over much of the state as residents deal with massive power outages brought on by whipping winds. This morning on the “Today” show, New Jersey Gov. 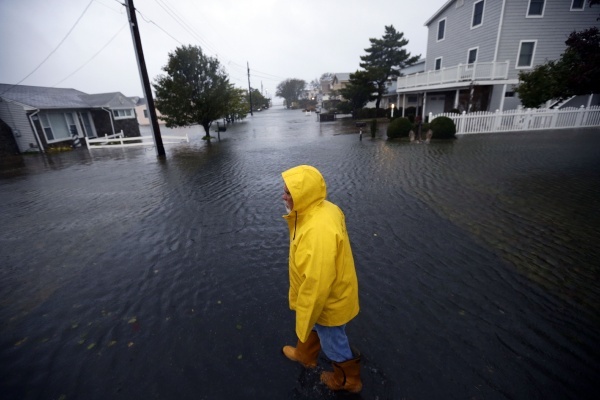 Chris Christie reported that at least three people died in the Garden State as Sandy ravaged the Jersey Shore from end to end. 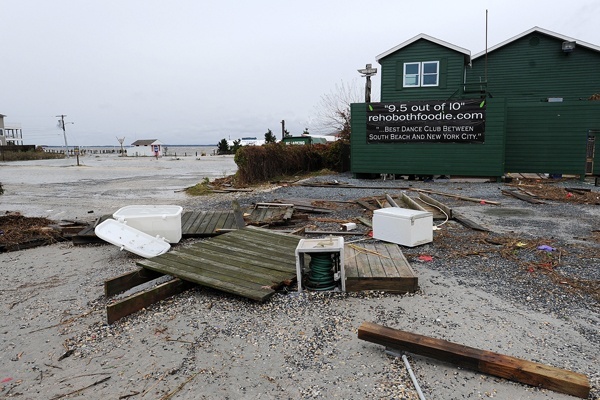 Both the Reuters and Bloomberg news services interviewed insurance industry sources who said East Coast damages from Sandy will outstrip those caused in August 2011 by Irene, and could reach $8 billion. The Delaware River Port Authority restarted service for the PATCO High-Speed Line on Tuesday at 6 p.m. Trains then will run east- and westbound every 30 minutes. After midnight, PATCO will run trains on a regular Night Owl schedule. Starting Wednesday at 6 a.m., trains will begin running on a modified rush-hour schedule. As of noon, SEPTA restored service on the Broad Street subway line, the Market-Frankford line and 80 percent of bus routes in the city and some routes in the suburbs. SEPTA officials said they are cautiously optimistic that they can restores two regional lines, the Media and Airport routes, by tomorrow. 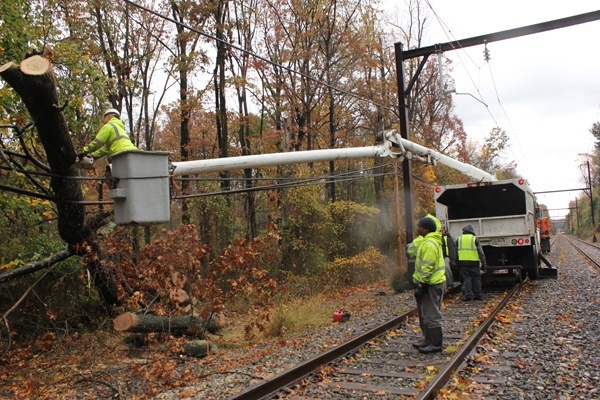 The other lines have too much damage, mostly downed trees, which SEPTA crews are working to fix. 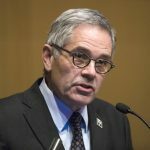 SEPTA general manager Joe Casey defended the agency’s decision to shut down service, saying safety had to be the top priority. 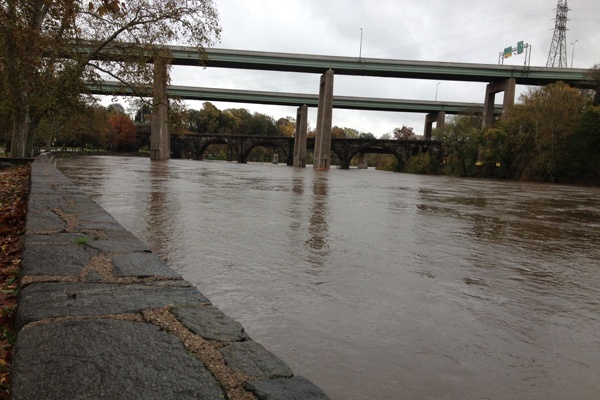 Bridges across the Delaware are now open. So is Philadelphia International Airport, but flights will return to normal slowly, beginning this afternoon. The airport advises everyone hoping to fly out of Philadephia today or tomorrow to call their airline to check on flight status. 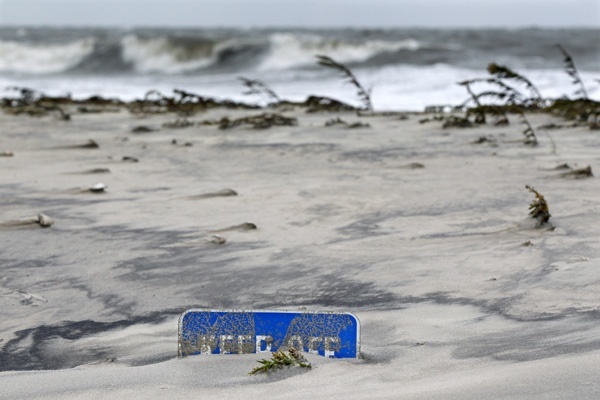 Airlines have canceled more than 15,000 flights, stranding travelers around the world. NJ Transit service is still suspended. 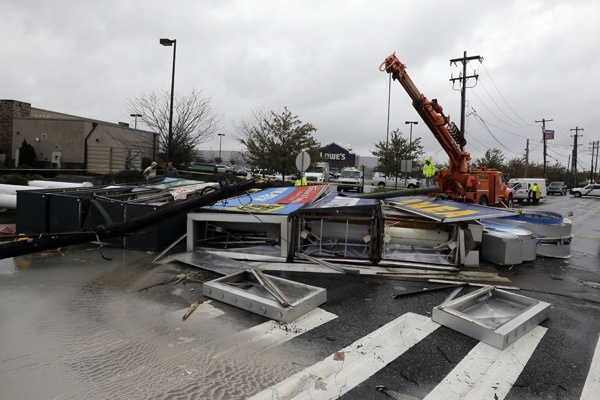 Nancy Snyder, spokeswoman for NJ Transit, said the storm has devastated infrastructure across the state. 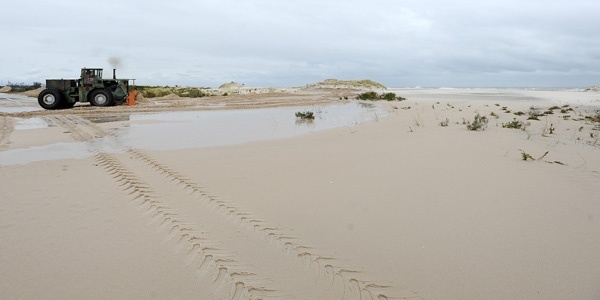 The agency is assessing damage in areas that need repair. 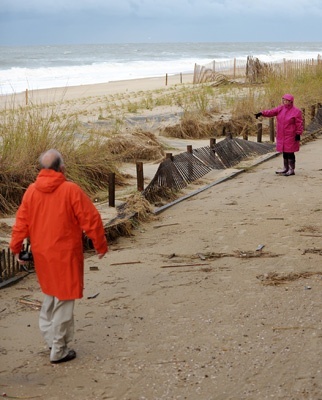 “We’re dealing with a lot of washed out tracks,” she said. 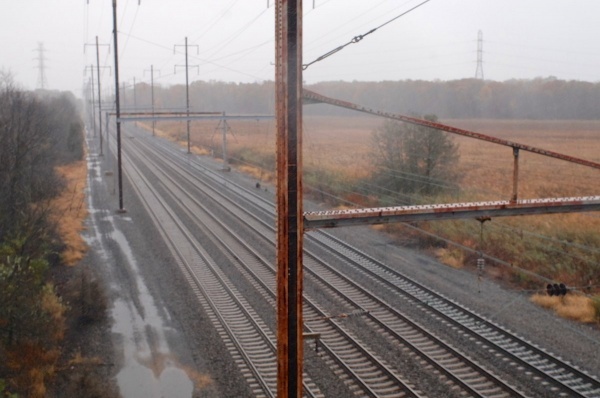 The agency is still inspecting buses, trains and equipment and more than 500 miles of track. Amtrak spokesman Steve Kulm said the service has crews out assessing the damage. 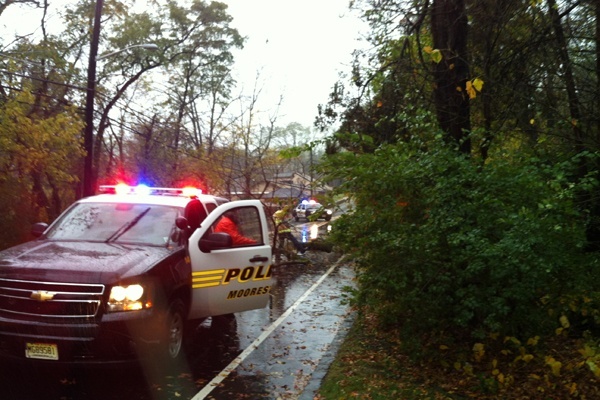 There are power lines down and trees across the tracks in some areas. Amtrak officials think limited service may return on Wednesday. Phila. 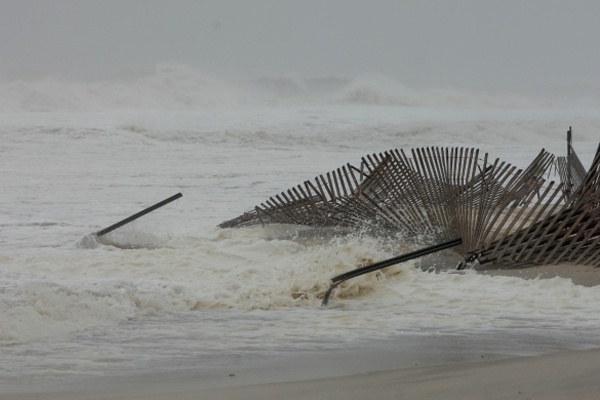 schools open Wednesday; many remain closed in N.J.
After being spared from the worst of Hurricane Sandy’s wrath, all of Philadelphia’s 239 traditional public schools, as well as the city’s charter and Catholic schools, will re-open Wednesday. 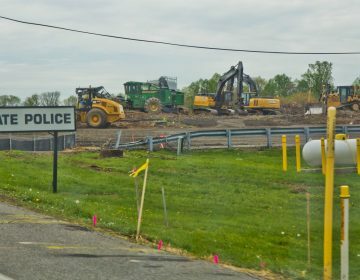 The Philadelphia Archdiocese advises school families in the suburbs to check with their schools for information about re-opening. 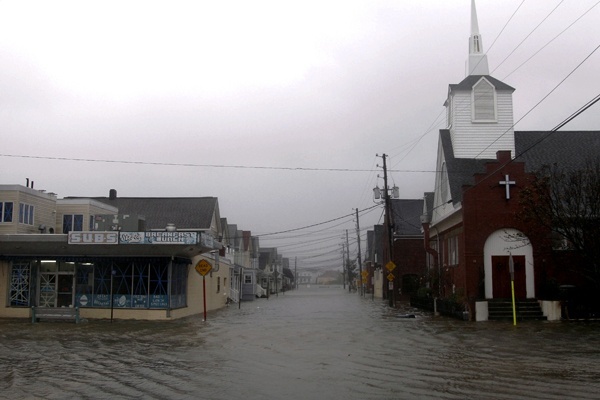 In Ocean City, N.J. — one of the region’s hardest-hit areas — schools will be closed for at least another day. 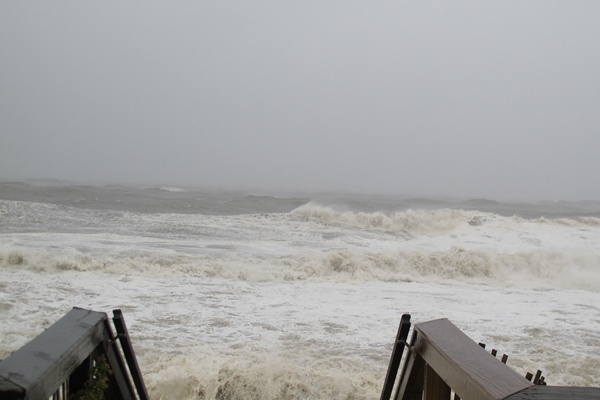 Many other school districts in the region had yet to make a determination as of Tuesday afternoon. 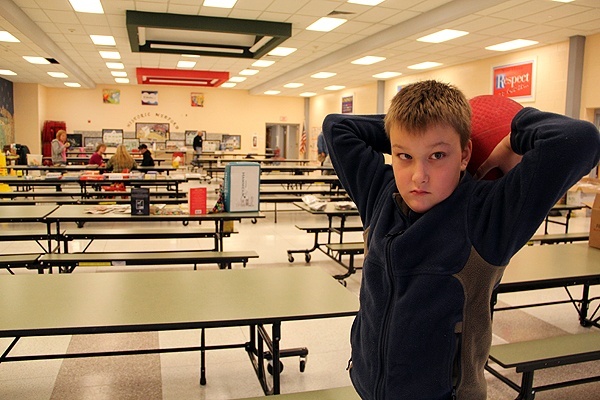 Benjamin Herold has more on area schools. 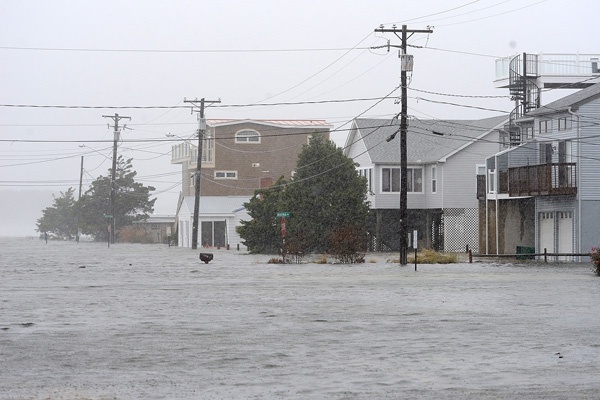 Delmarva Power has some good news for those who are with out power. 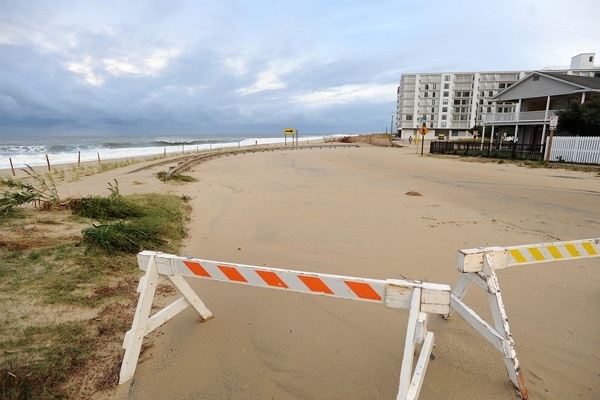 The city of Wilmington also reports it will be open for business on Wednesday. 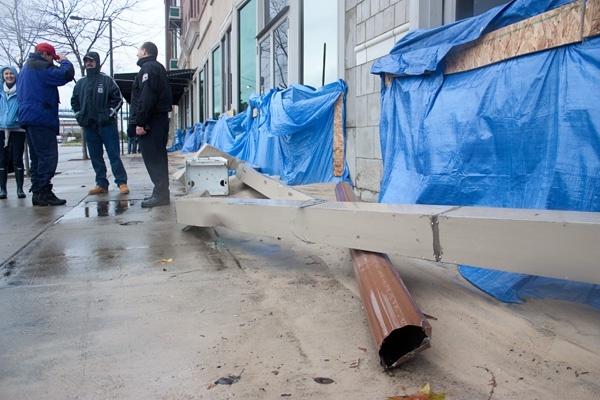 The city is lifting its emergency order just after 3 p.m. So residents can return to their homes in the Southbridge neighborhood.Wilmington officials say they will provide assistance to anyone currently at the shelter at William Penn High School if they are having difficulty getting back to their home. City offices will be open normally on Wednesday as well. 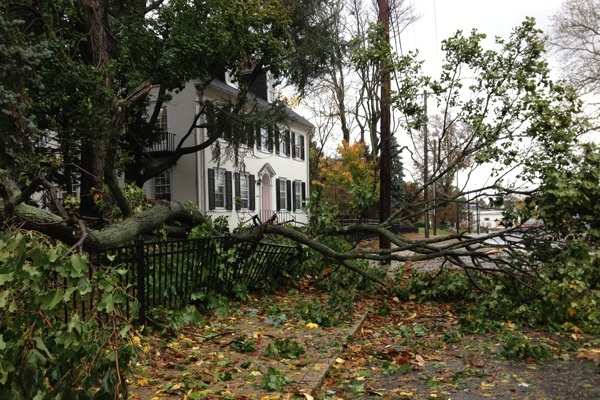 Delmarva Power said it has made a lot of progress in getting the 40,000 customers still without power back on line. 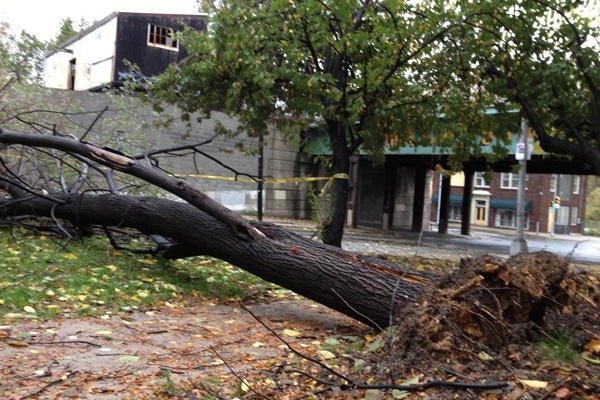 Company officials say the majority of their customers should have power on Wednesday. They also believe everyone should have their power back by Thursday evening. 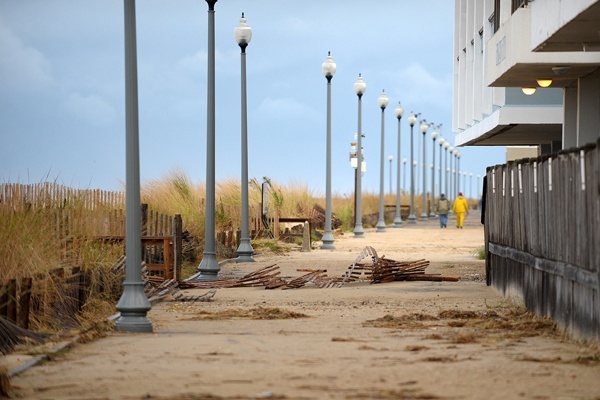 Much of the damage from Sandy in Delaware was confined to the coastal areas and sections of the state prone to flooding, but Gov. 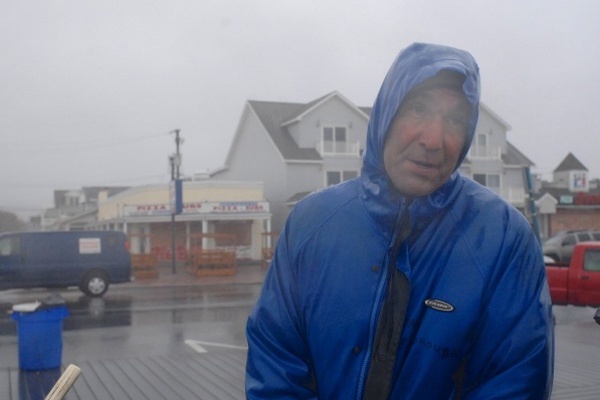 Jack Markell says the state was spared the brunt of the storm. 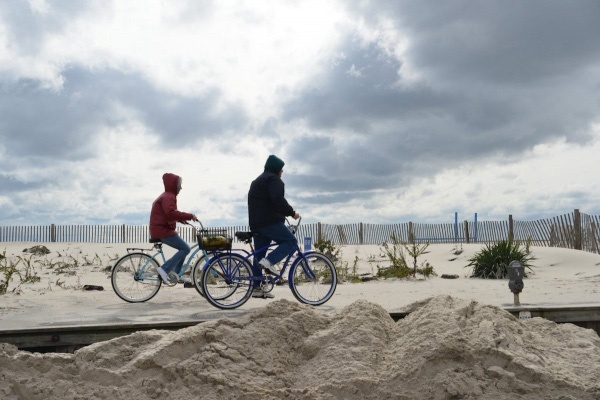 As Sandy moves north, Gov. 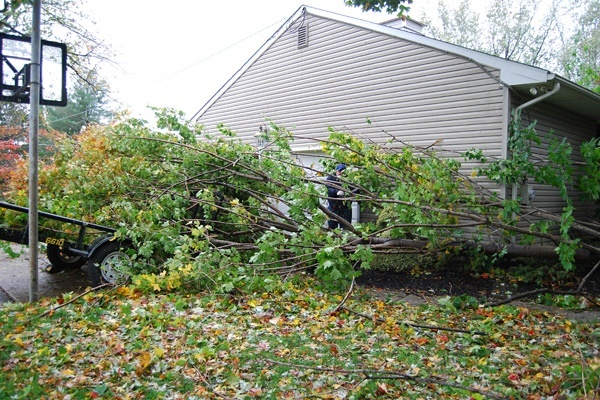 Tom Corbett is sending help to neighboring states dealing with major damage in the wake of the storm. 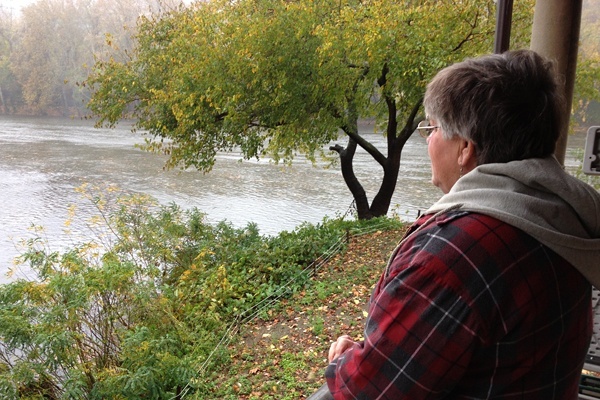 Corbett says Pennsylvania is certainly better off than some coastal states. 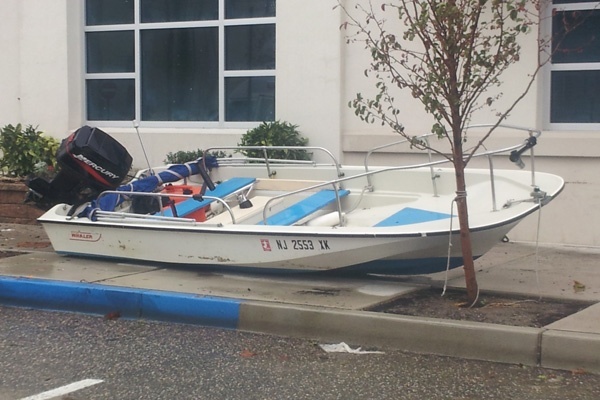 It’s “a very large vehicle that allows you to transport more people than you can an ambulance,” Cannon said. 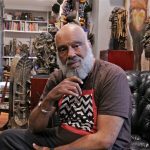 “So it’s not that there are large numbers of dead folks that they’re trying to deal with, that’s not the case, but because we have this very sophisticated piece of equipment in Pennsylvania, they know it, it’s been asked for. 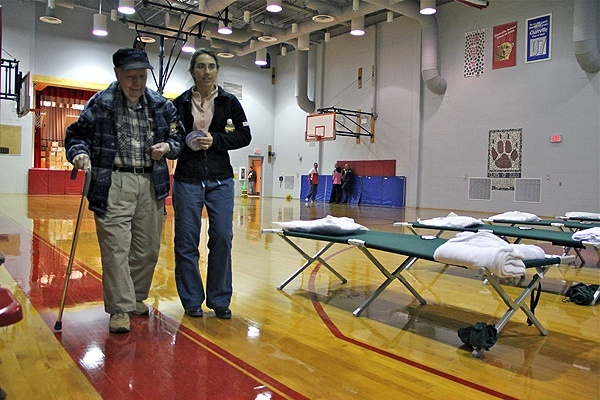 Corbett has opened two “megashelters” at two state system schools for out-of-state evacuees. 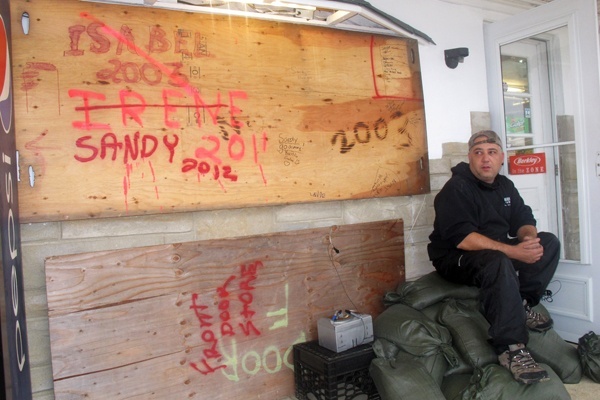 “Those are primarily for the New York and New Jersey but if people in the area need it, they can go there,” he said. One “megashelter” will be at West Chester University and another at East Stroudsburg University. They can hold up to 1,300 and 500 people, respectively. 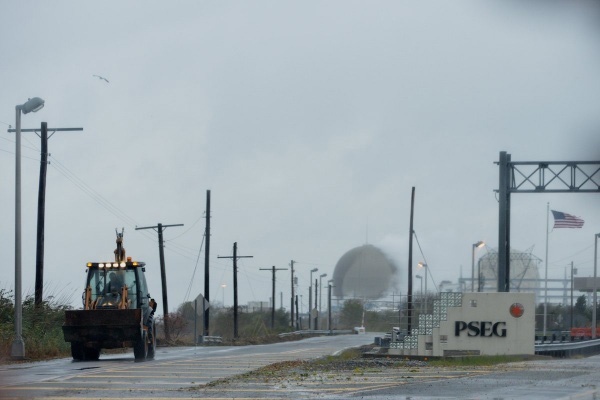 Nuclear power plants and oil refineries in the eastern half of the state reduced their output but did not shut down as the storm passed over the Delaware Valley. 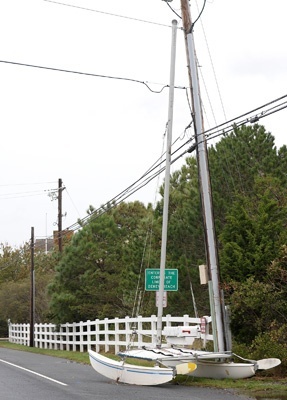 They are back to normal, according to the governor and the chairman of the Public Utility Commission. 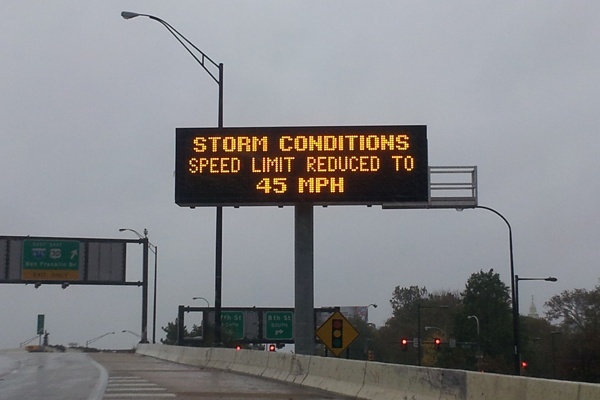 Speed and vehicle restrictions were lifted Tuesday morning on all but Interstate 90 and Interstate 79 in the northwest. Another 100 National Guard soldiers have been deployed throughout the commonwealth, bringing the total to 1,700. 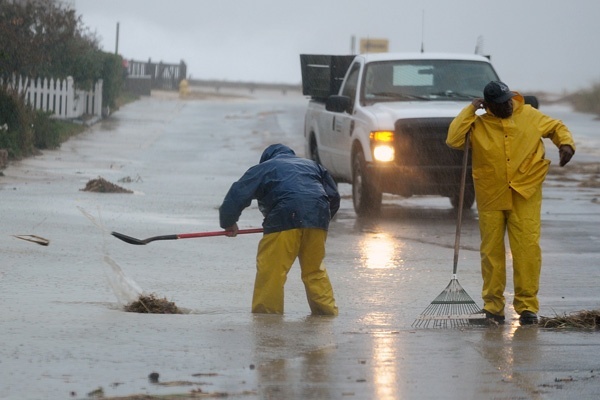 Corbett said about 600 people are in shelters statewide, which have the capacity to take in 31,000 people, following warnings of flood dangers and evacuations. 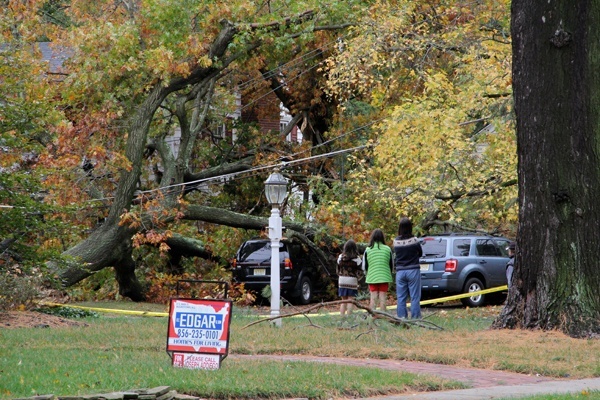 He urged residents to stay home while road and utility workers assess damage. 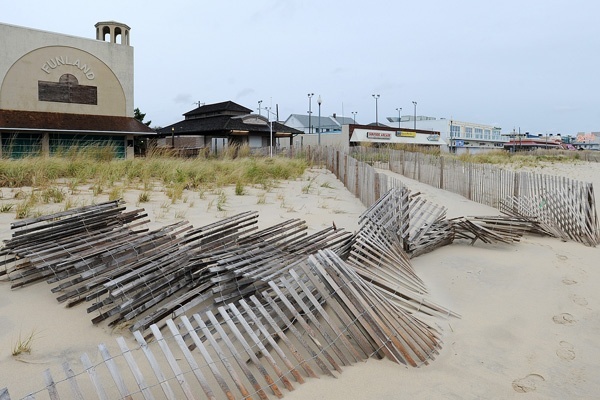 The Jersey Shore is recovering from the major blow it suffered as Sandy roared ashore Monday night. 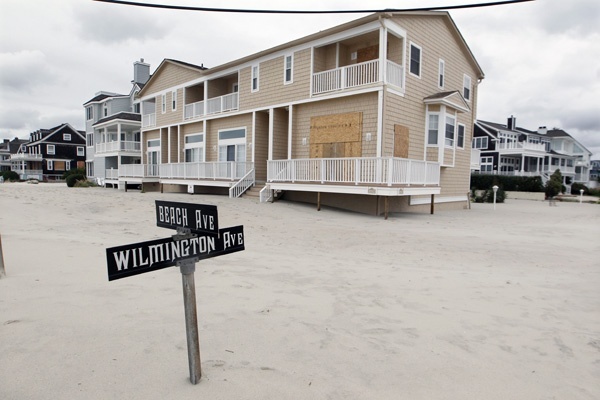 The Category 1 hurricane eradicated beaches, obliterated dunes, stranded stragglers and darkened millions of homes. 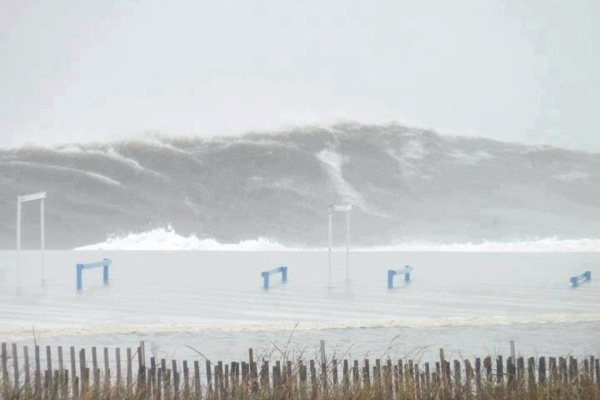 Houses have been knocked off the foundation in Seaside Heights. 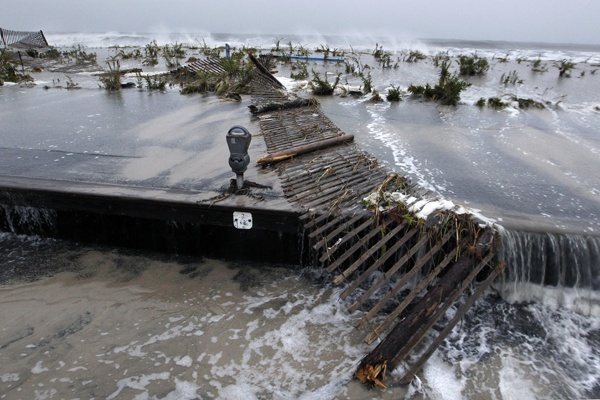 Piers and boardwalks have been torn up along the coast. 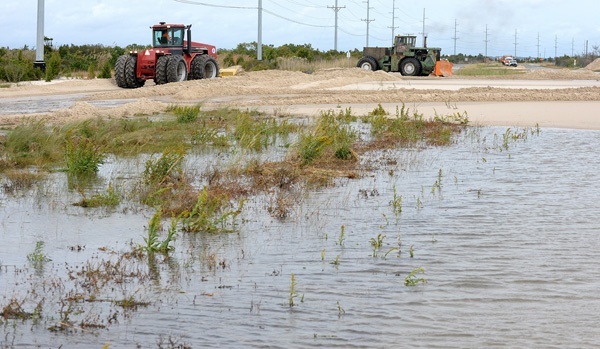 Some areas were still under water Tuesday. Christie called for patience during the recovery process. 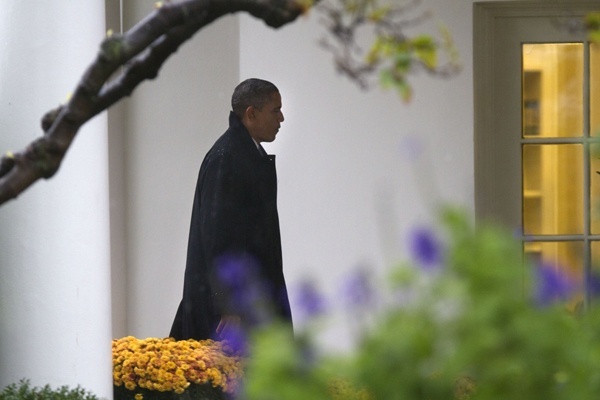 He said he will report his own eye-witness account of the damage to President Obama later today. 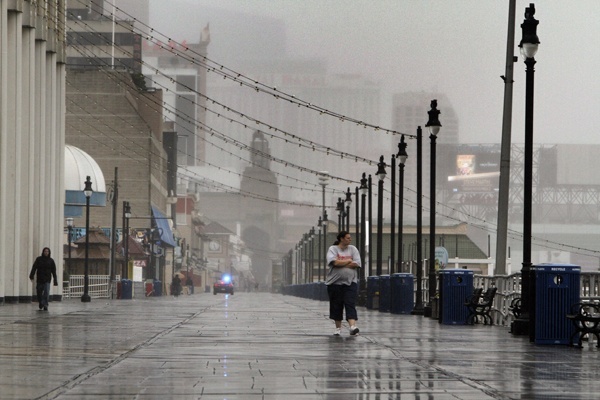 The Associated Press reports that Atlantic City’s 12 waterfront casinos came through the superstorm largely unharmed. 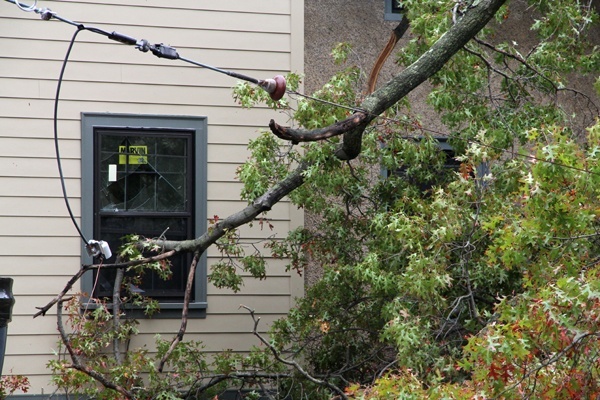 Most are reporting only minor damage like some small water leaks or a handful of broken windows. 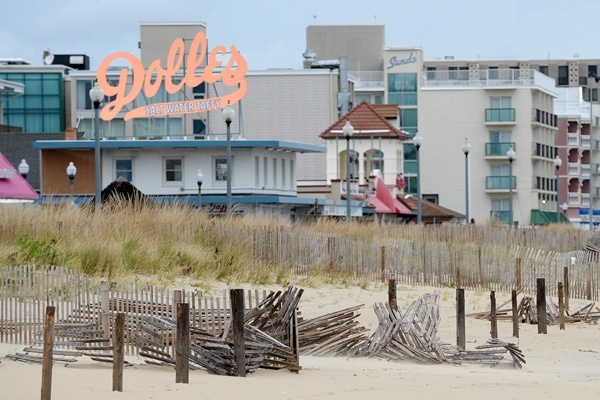 The casinos will confer with state regulators later Tuesday about a reopening date. 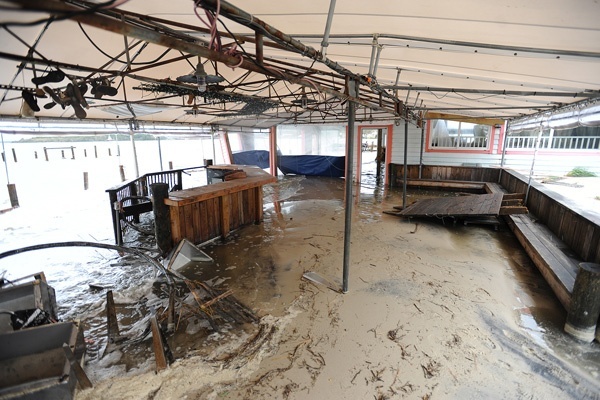 All are eager to reopen, but acknowledge it still could be tricky getting employees and customers to come while still dealing with damage in their own communities. The shutdown is costing the casinos a collective $5 million a day in lost revenue. 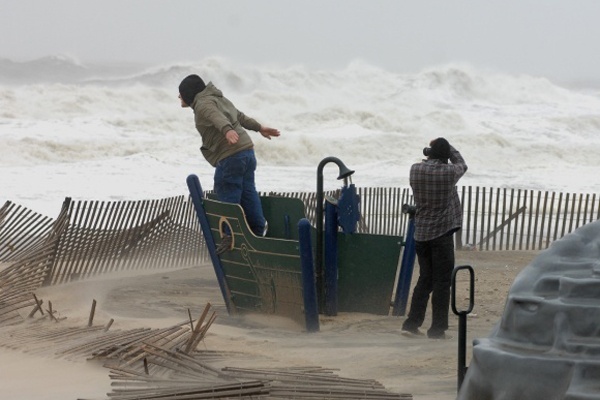 WHYY/NewsWorks’ Alan Tu and Tom McDonald were up early today, touring storm-ravaged sections of South Jersey. 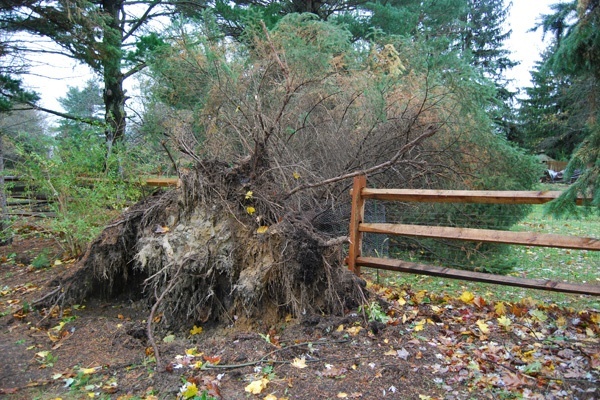 “Mercer County had many large trees felled, but flooding was surprisingly light. 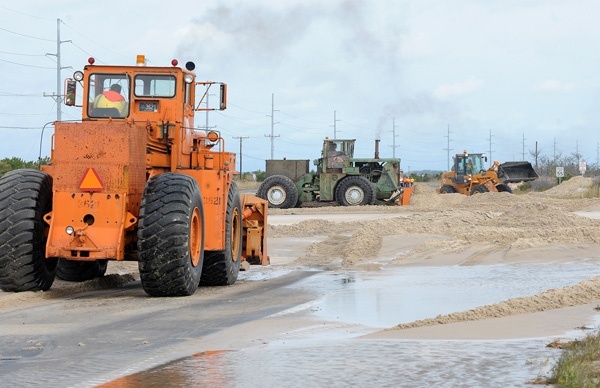 Even flood-prone roads were spared. 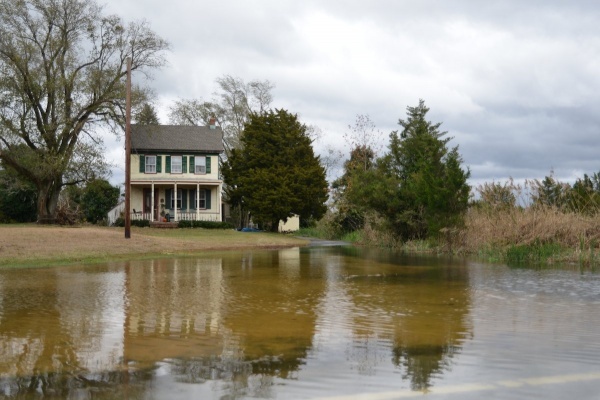 The Delaware was higher than usual at Bordentown, but well within its banks. 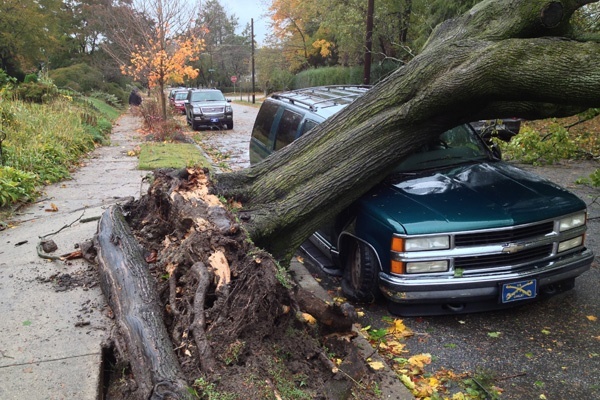 “The scenes in Cherry Hill, Lawncrest and Magnolia were similar: Downed trees and branches, but less damage than one might expect the morning after a hurricane passed through. Power outages are widespread, though. 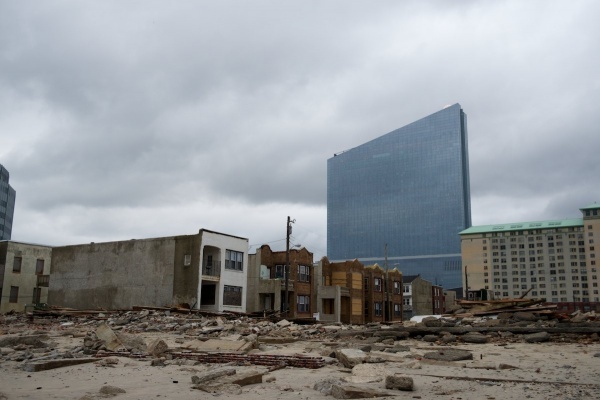 “For the most part the casinos in Atlantic City seem fine from what I can see. 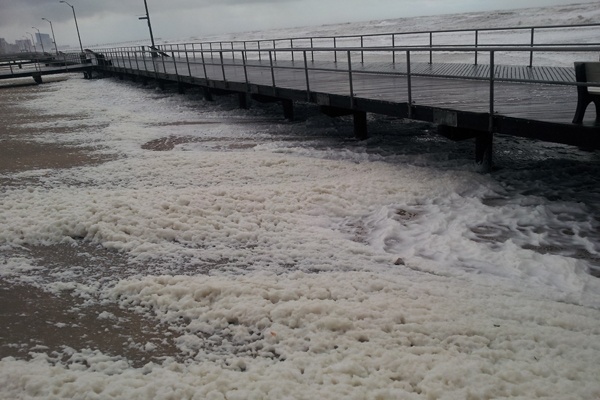 They used sandbags heavily. 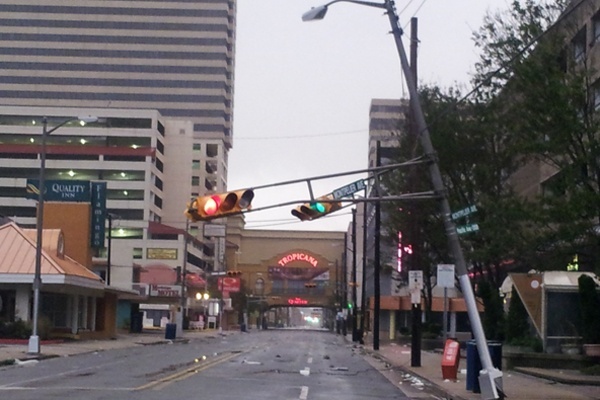 There’s some wind damage in the casinos area. 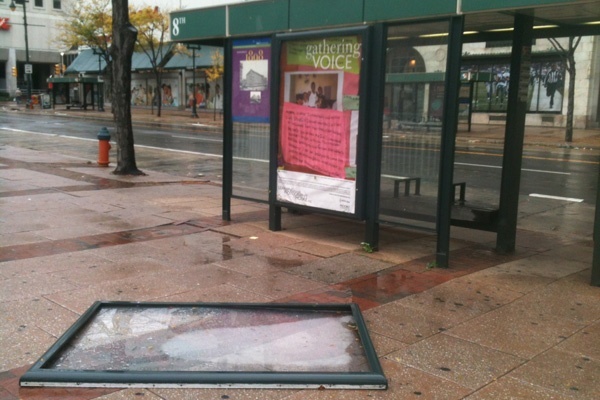 Some bus shelters were blown down. 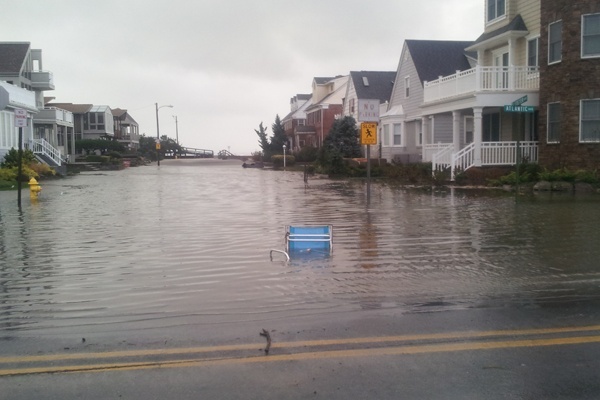 “Flooding in the south end of Atlantic City was minimal. 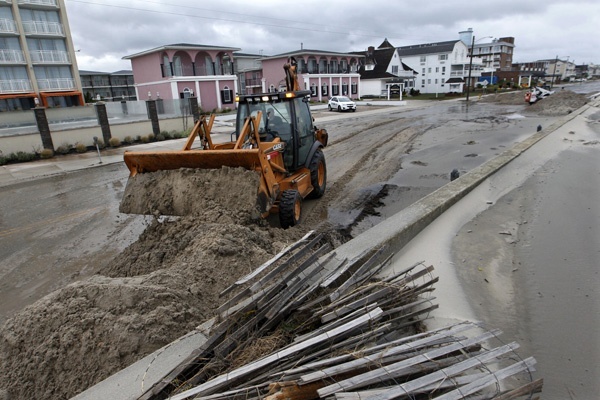 On the north end, it was much worse, near Revel and where the boardwalk was washed away. 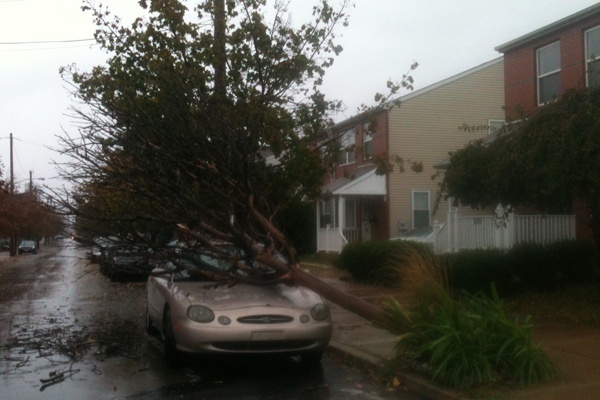 “Heading through Ventnor, Margate, and Longport, the wind damage is heavy. 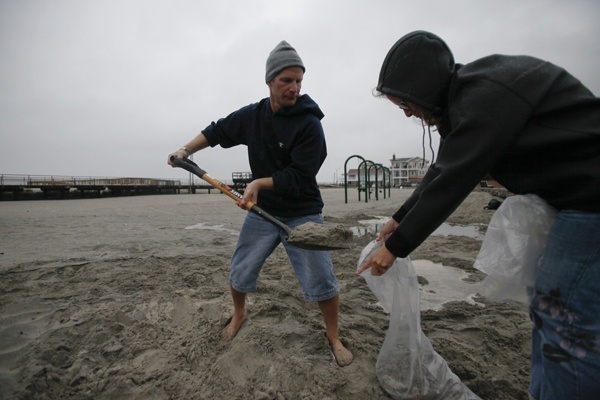 “One woman on a beach block whom I talked to said she experienced 10 feet of water. 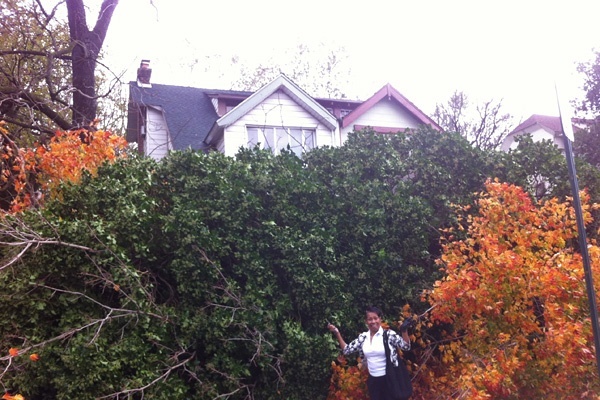 She said it was up to within two feet of her deck, and her deck has to be 12 feet up in the air. 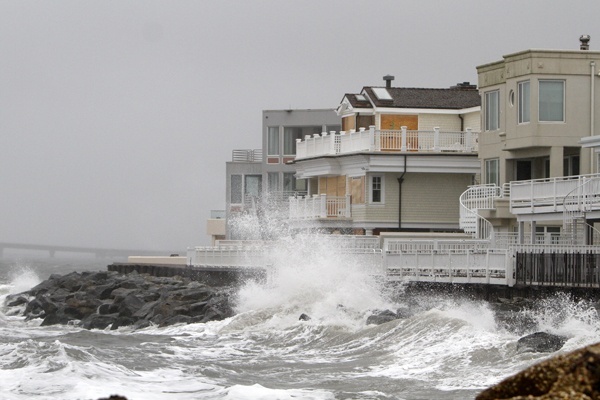 “There is no beach in Ventnor; water laps all the way up to the boardwalk. 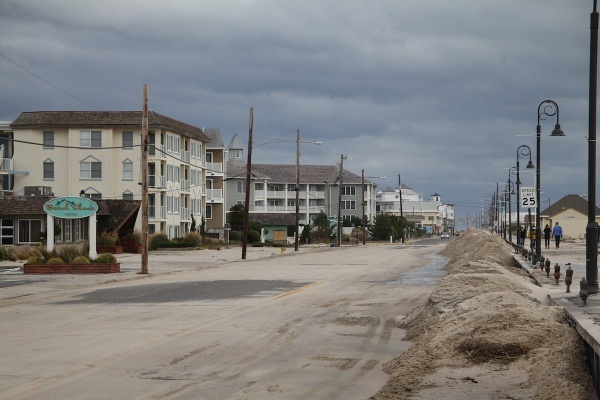 In Ventnor, and it’s just the same in Margart and Longport, the ocean carried beach sand right over the boardwalks onto the streets. 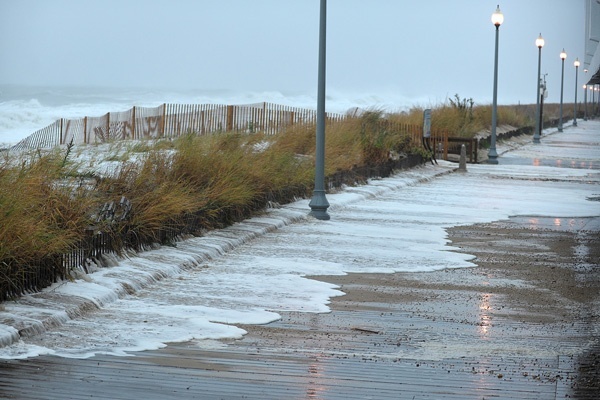 Any street parallel to the board walk is covered in three to six inches of sand. 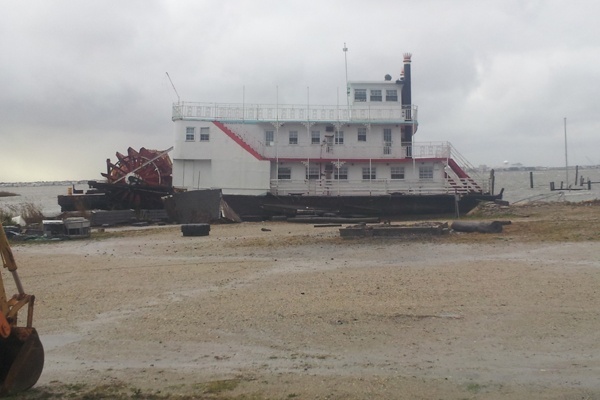 “At Anchorage Point, a paddle wheel boat was lifted right out of the water and is sitting on the beach. 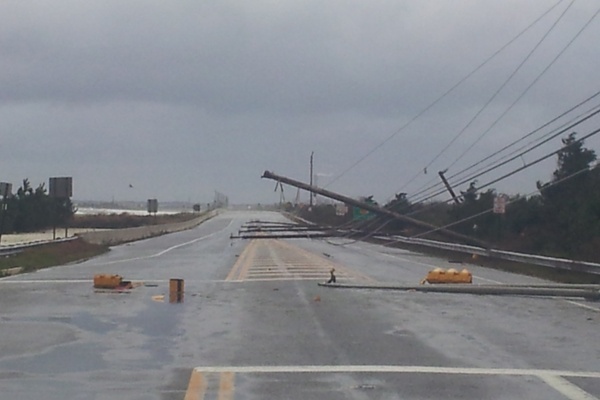 “The road between Longport and Ocean City is not passable; telephone poles are down. 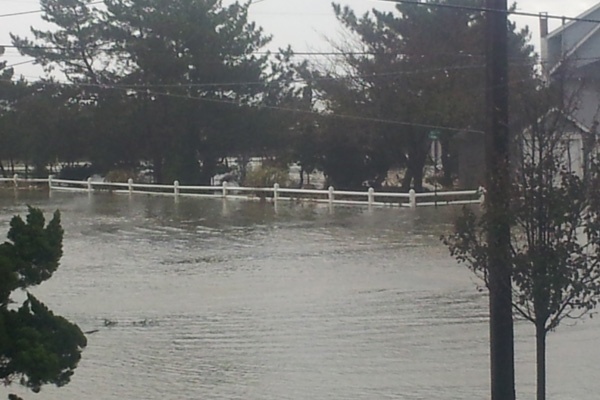 “The bridge to Ocean City is impassable. 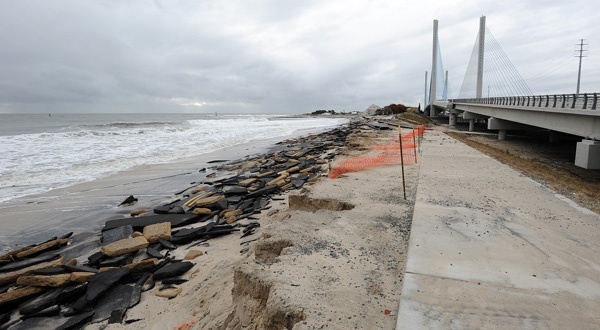 The storm lifted the rocks in the seawall right onto the highway going to the bridge. We’re talking about 500-pound boulders sitting right in the road. “And this is something! 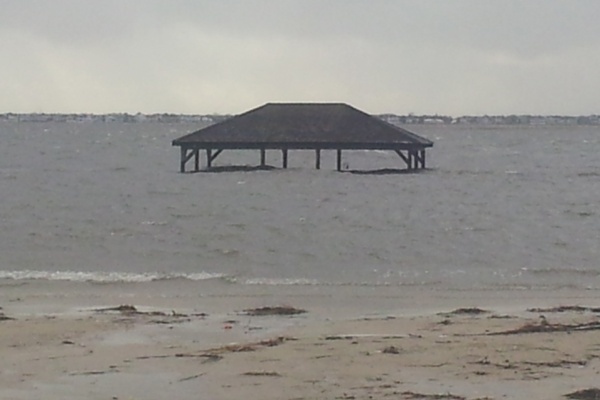 At Somers Point, the fishing pier off of New Jersey Avenue, it’s just sitting in the bay. 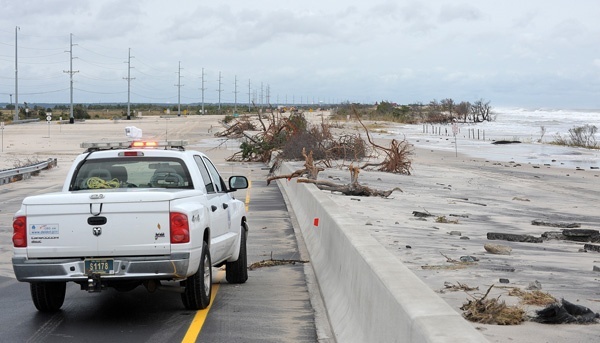 The entire length of the Garden State Parkway has reopened. 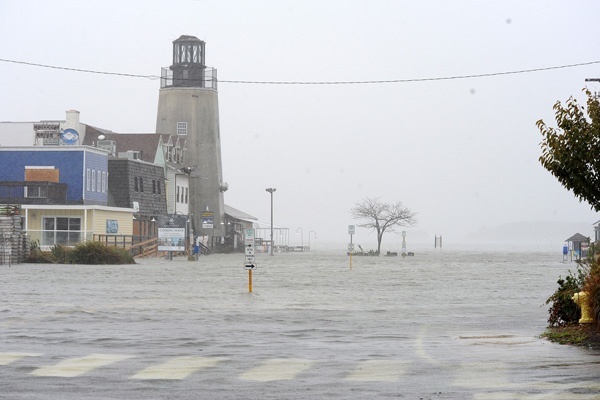 A 129-mile stretch was closed in both directions from Woodbridge to the southern terminus because of flooding caused by Sandy. 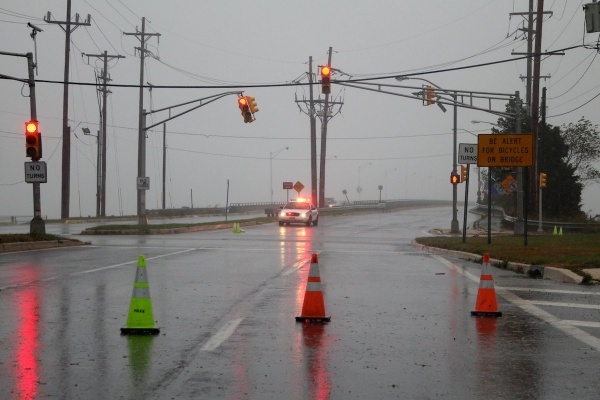 Southbound lanes on the New Jersey Turnpike are closed between Exits 10 and 14. The Lincoln Tunnel is open. 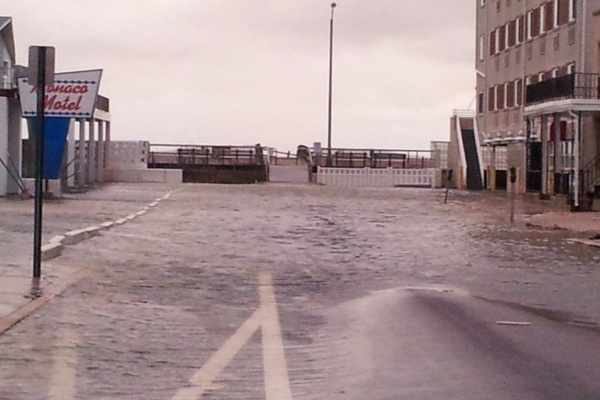 The Holland Tunnel is closed under further notice. 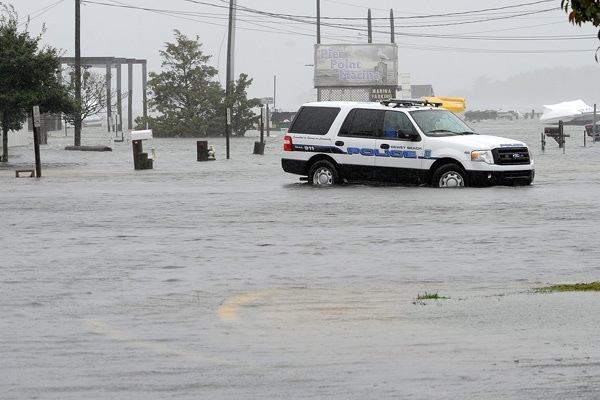 The George Washington Bridge, Goethals Bridge, Bayonne Bridge and Outerbridge Crossing are closed until further notice. 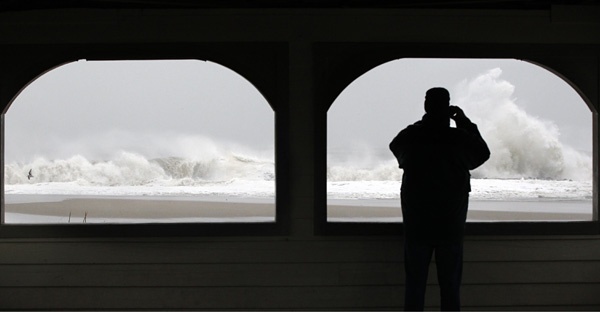 Schools are closed today throughout New Jersey. 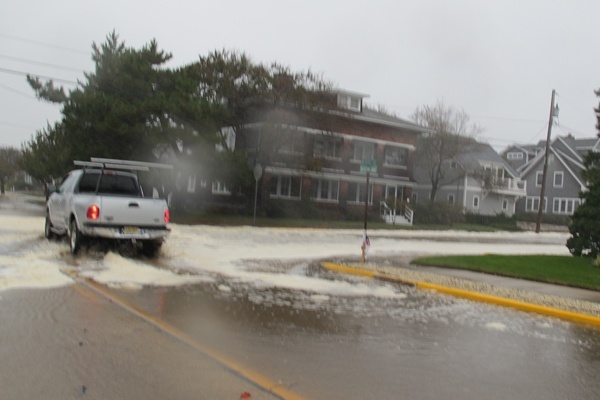 Ocean City School District, where there were reports last night of flooded school buildings, will keep its schools closed again tomorrow, said Richard Stepura, Cape May County’s interim executive superintendent. 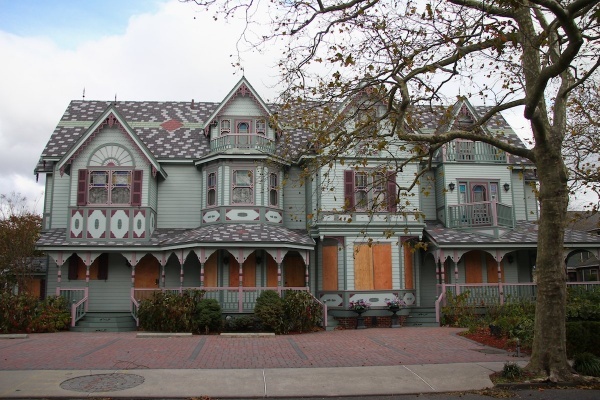 The 15 other school districts in Cape May County will all have to make individual determinations today, Stepura added. 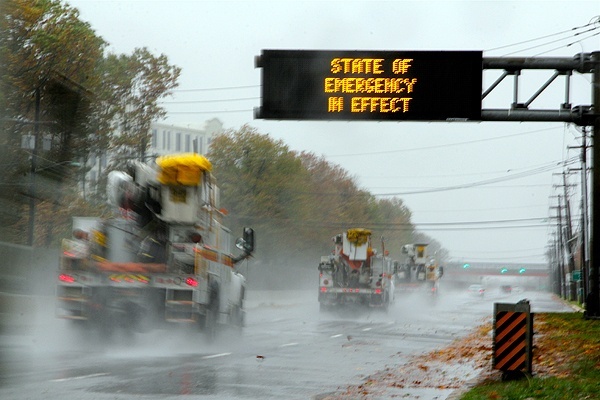 At least 8.2 million people across the eastern half of the U.S. are without power, including more than a million in Pennsylvania alone, but officials say the worst is over. 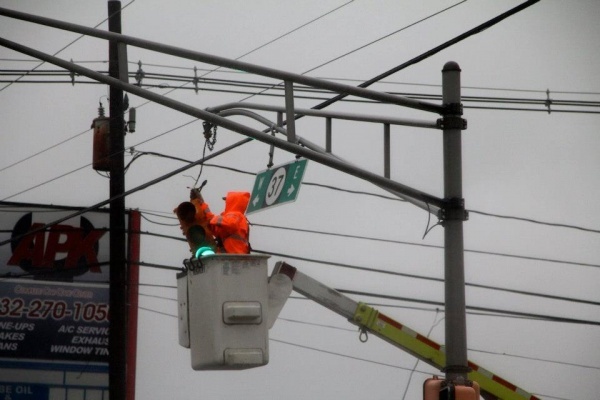 PSE&G reprted at 6 p.m. Tuesday that power has been restored to about 20 percent of the 1.4 million of its customers who lost power during Hurricane Sandy. 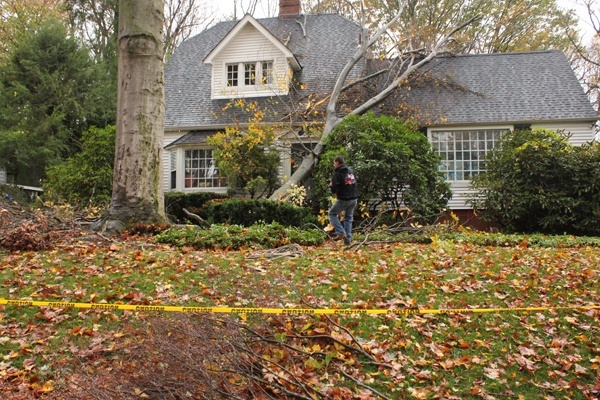 Customers without power now number between 1 and 1.5 million. 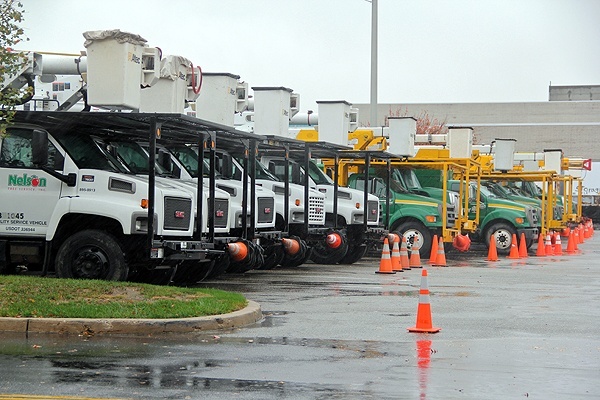 Today the utility successfully brought three flooded substations back on line to restore feeder lines that serve Newark, Elizabeth and Newark Airport. Work will continue on other stations including ones that serve Jersey City and Sewaren. 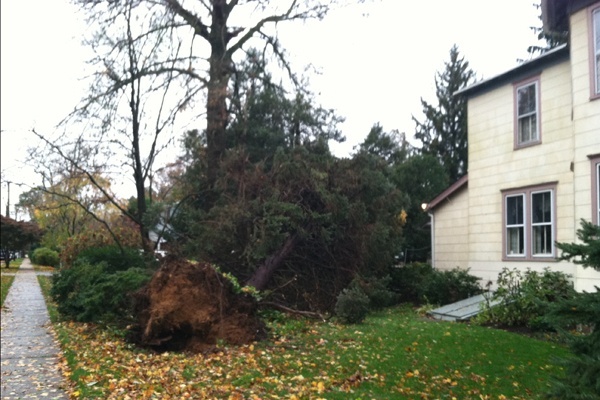 The utility says it may take a week or more to get power restored to all customers without power. 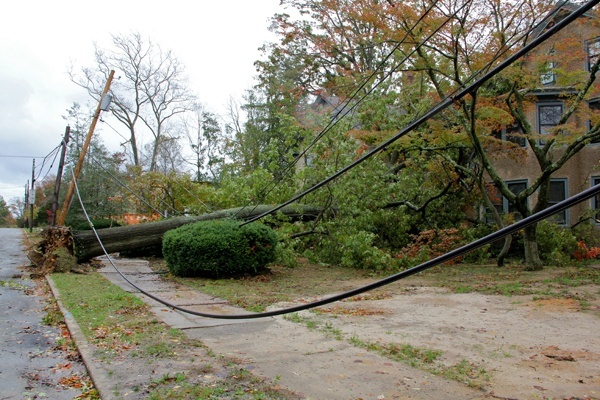 In a morning briefing, PSE&G president Ralph LaRossa said the company has about 1,300 employees out assessing the damage and repairing lines from the “biggest storm” PSE&G has ever seen. He says the utility is focusing on getting the main power lines restored first, then moving on to smaller neighborhoods and streets. 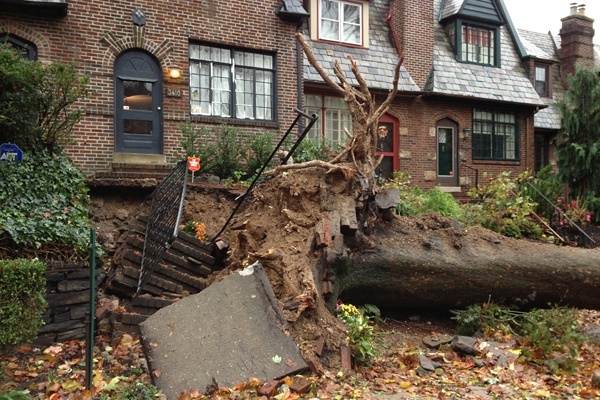 Some utility customers in the Philadelphia area could be without power for days. 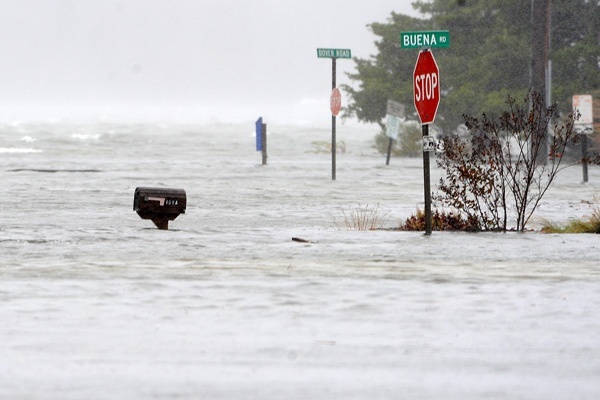 Schools and government offices across the state remain closed. 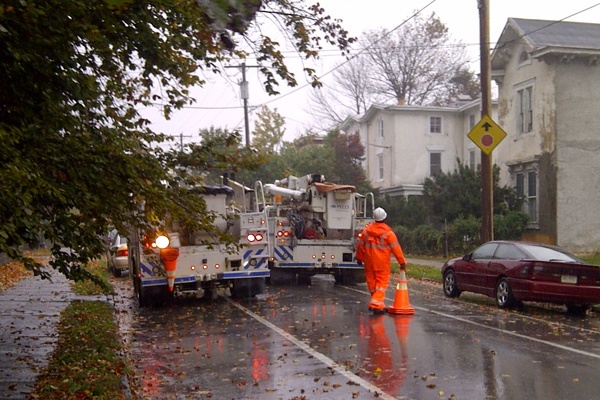 PECO reports a record number of outages in its service territory: 585,000 customers. 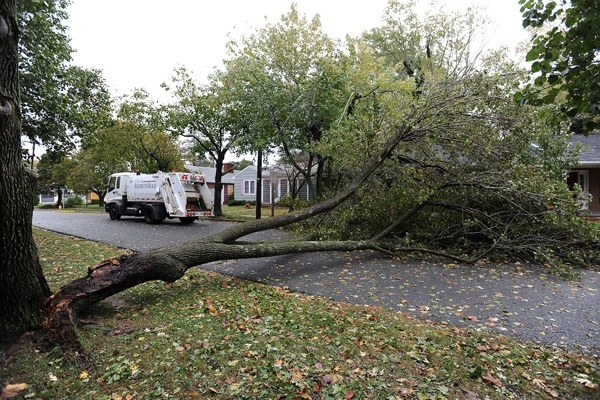 Hardest hit was Bucks County, with 185,000 outages. Montgomery County has about 175,000; Delaware Couny, 86,000; Chester County, 74,000, and Philadelphia with 65,000. 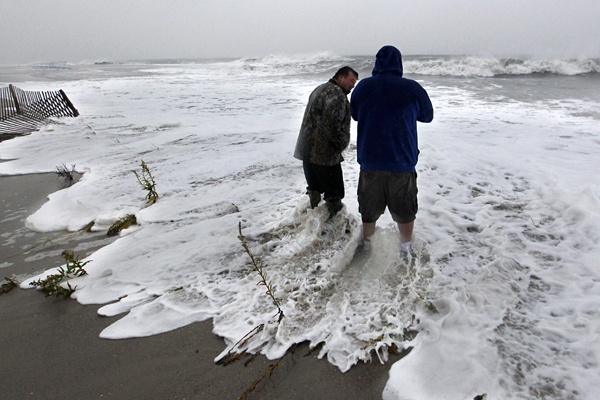 Along the Delaware Bay in South Jersey, the impact of the storm has left one nuclear cooling plant offline. 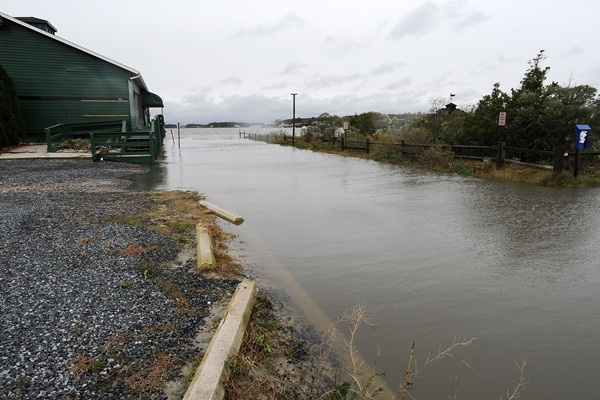 At the Salem Nuclear Power Plant, Salem Unit 1 has been shut down as a result of four of its six circulating water pumps being disabled by Sandy. The pumps draws water from the Delaware Bay water to condense steam in the plant. 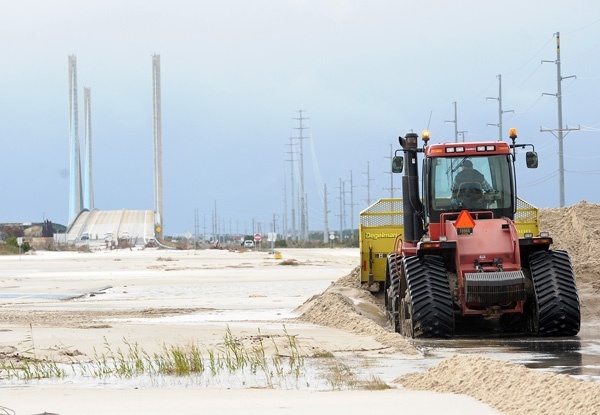 PSE&G yard worker, Kenneth Stanley told Newsworks that the only access road to the nuclear complex was flooded during Monday night’s high tide. 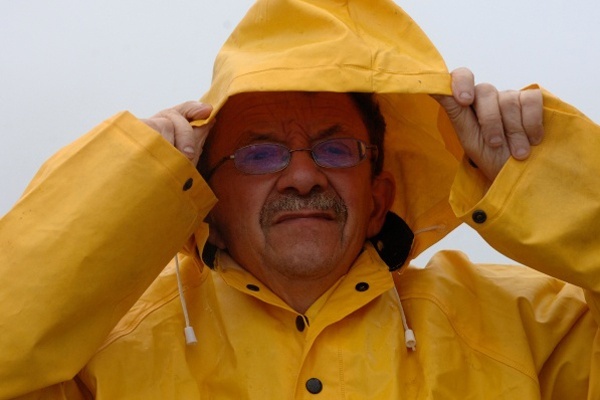 “The tide’s still coming in, it might come over again today,” Stanley remarked. 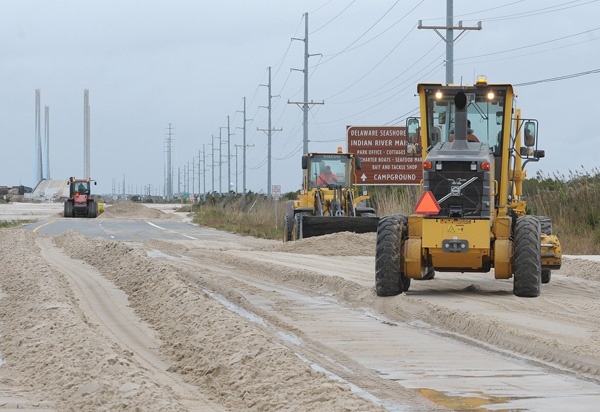 Workers are currently reinforcing the stone barriers along the roadway, hoping to prevent flooding and erosion from the next high tide. 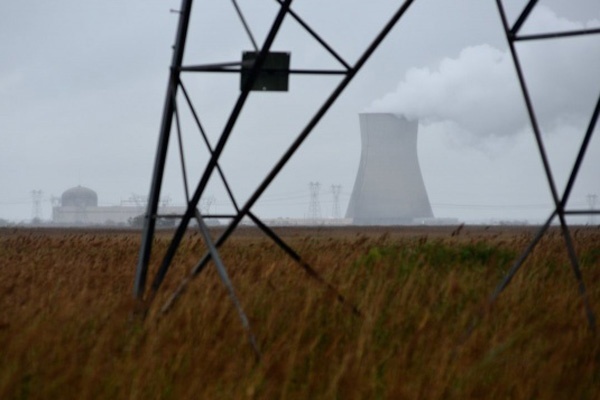 Salem Unit 2 and the neighboring Hope Creek nuclear plant remain at full power. Gov. 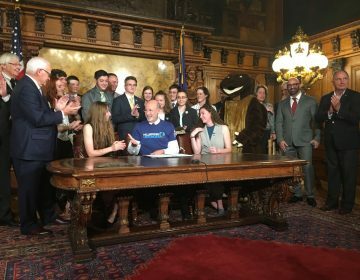 Tom Corbett says there is still no plan to extend the Friday deadline for turning in Pennsylvania absentee ballots to county election boards, in spite of postal office and courthouse closings. 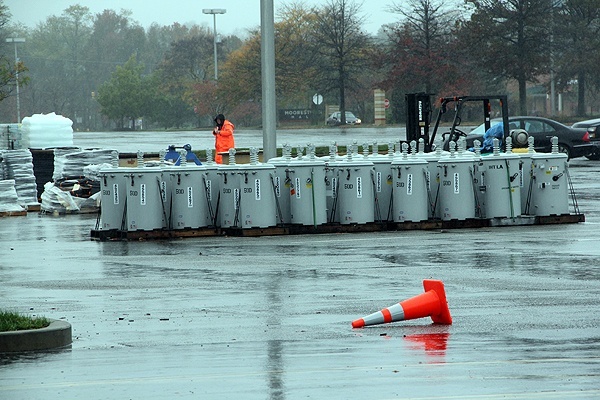 There is no word yet on whether election proceedings will be affected by the storm. 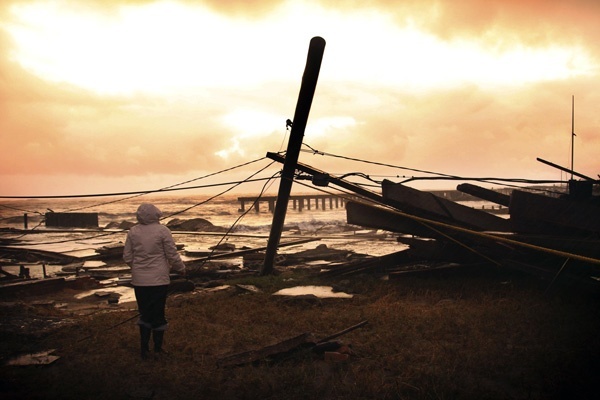 The question has come up now because it could take days to fully restore power across the East Coast — and the election is just a week away. 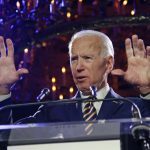 Congress sets the date for the presidential election and could change it, but the Associated Press reports it’s unlikely that would happen. Congress would have to come back from recess and pass a law. Plus, it would wreak havoc on state and local elections scheduled for the same day. Philadelphia continues to be quiet and perhaps a bit relieved, with damages so far light compared with the Shore and New York City. 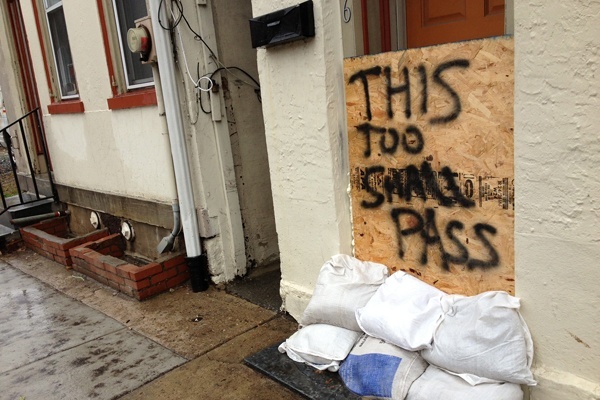 To this point, the flood-prone Schuylkill is staying within its banks in Manayunk and East Falls. The storm shelter set up at Cheltenham High School has been closed due to a power outage. 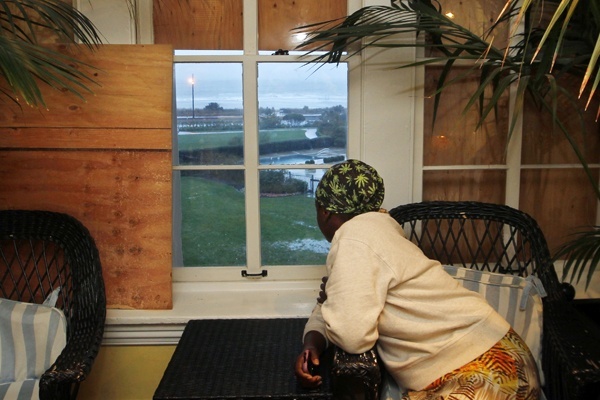 In Montgomery County, shelters at Pottstown and Norristown high schools remain open. 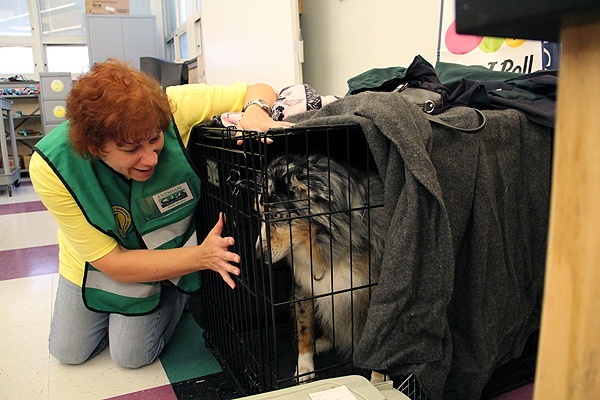 Red Cross reports that 619 people and 53 pets were in its shelters around the Philadelphia region as of midnight. 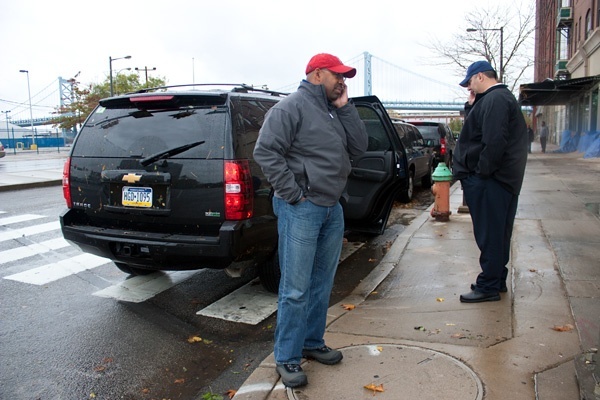 The biggest group is at West Philadelphia High School, where 243 people sought shelter. Avon Grove High School in Chester County has a big group, with 58 people. 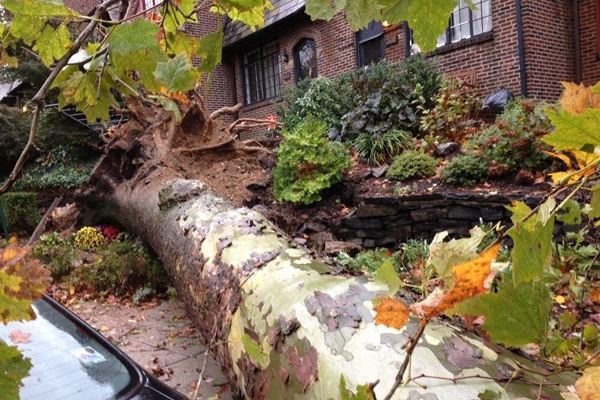 The city reported that it has received 16,000 calls on its 311 non-emergency line since yesterday. Normal Monday traffic is about 4,500 calls. 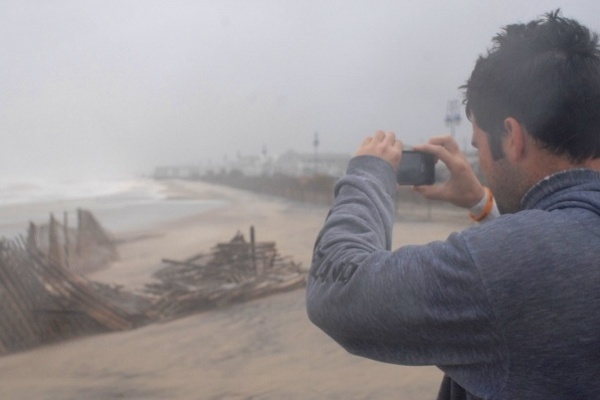 To anyone in lightly hit areas who thinks that metereologists and officials hyped the storm threat, here’s what Accuweather’s Elliot Abrams has to say: You’re wrong. 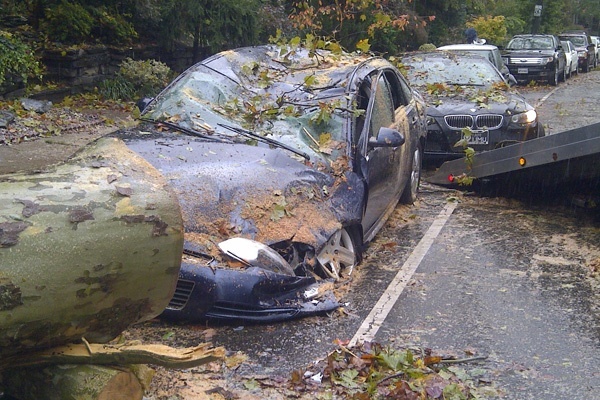 Sandy still was quite a storm, he said. Some areas just were luckier than others. 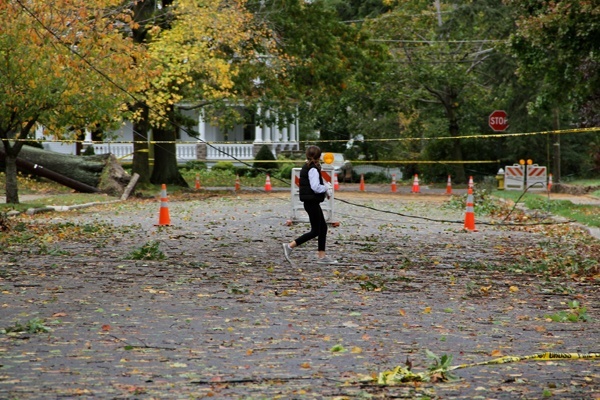 Abrams says many will still feel gusty winds and showers Tuesday, with the possibility of falling branches. 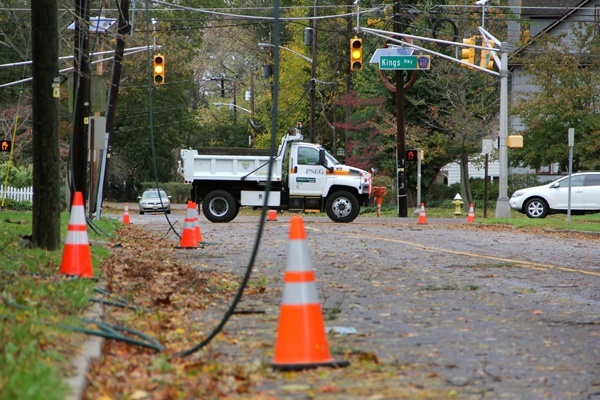 Utility companies are working to restore service, but warned it could take days. 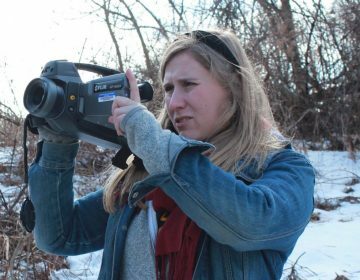 —Brian Hickey, Elizabeth Fiedler, Emma Jacobs, Tom MacDonald, Jennifer Lynn, Aaron Moselle, John Mussoni, Holly Otterbein, Nichelle Polston, Zack Seward, Jana Shea, Alan Tu, Mary Wilson and the Associated Press contributed to this report.